Microsoft’s CEO Satya Nadella tells the inside story of the company’s continuing cultural transformation and in this process he traces his own journey from a childhood in India to the most meaningful changes in the digital era. He offers his vision for the coming wave of intelligent technologies such as artificial intelligence, mixed reality and quantum computing. The book is divided into nine chapters: from Hyderabad Redmond, Learning to Lead, New Missions, New Momentum, A Cultural Renaissance, Friend or Frenemies? Beyond the Cloud, the Trust Equation, the Future of Humans and Machines and Restoring economic growth for everyone. 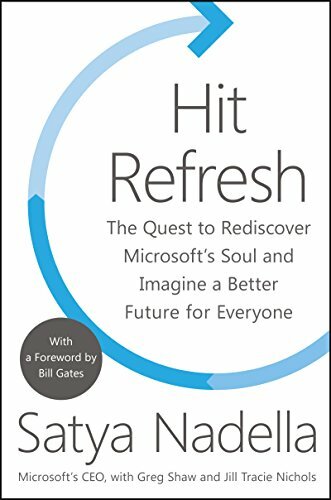 Nadella examines how people, organisations and societies can and must transform, how they must ‘hit refresh’ in their eternal search for new energy, new ideas and further relevance and renewal in technology and in our minds. Satya Nadella, the son of an Indian civil servant, studied hard, got an engineering degree then immigrated to the USA and made it in tech. He gets philosophic and tells about humans and how the quality of empathy, creativity, judgement and accountability can play a big role in the lives of young people. He also gives advice to young minds with a famous line by former President Ronald Reagan: ‘Trust but verify.’ In German there is a similar saying: Vertrauen ist gut aber Kontrolle ist besser. Trust is good but control is better. From his Indian Hindu heritage he brings in the ancient Sanskrit word ‘vishwas’ which stands for: faith, trust and belief. All these qualities, he emphasizes, will become more valuable in a world where technological advancement will alter the status quo like never before. Technology intelligence, according to Satya, is intelligence that serves to help human capabilities and capacities. What makes the book interesting is the account of his childhood, the British game of cricket which is very popular in the Indian subcontinent, literary quotations and his marriage with Anu, his wife. Nadella was 21 when he migrated from Hyderabad (India) to the USA to pursue a master’s degree in computer science. He joined Microsoft in 1992 and defines himself as a humanist and a technologist. His mission? Empowering every person and every organisation on the planet to achieve more. Nadella’s stand is that: America first in America. India first in India. The UK first in the UK. We all must do this while staying steadfastly anchored in our timeless values. Microsoft is a company born in America. He believes in the American Dream, both in living it out as employees and helping others do the same. Our allegiance, he says, is to a set of enduring values: privacy, security, free speech, opportunity, diversity and inclusion. However, in the aftermath of President Trump’s America First policy and the possible expulsion of……experts of Indian origin, Satya’s words sound like a dream that has not much to do with the reality of US politics 2018. He subscribes to the notion that the bigger the company is, the more responsibility its CEOs have to think about the world, its citizens and their long-term opportunities. ‘You’re not going to have much of a stable business if you don’t think about the growing inequities around the world and do your part to help improve conditions everywhere.’ After all the C in CEO stands for the curtor of culture. This culture needs to be a microcosm of the world he hopes to create outside of the company where great things are achieved by creators in the outer world. A microcosm where every individual can be their best self, where diversity of skin colour, gender, religion and sexual orientation is understood and celebrated. The hopes are high but the street-reality in the States shows a sorry picture with Republicans and neo-nazis, followers of the Rifle Association, the spreading of lies about climate-change, the regression of the society towards biblical dictates and the denouncement of science and technology. The Microsoft makers and CEO share their personal passions, reflect on who they are at home and at work and how they connect their work persona with their life persona. The central concern is quite effectively expressed and the mission is to change the world. That was way back in 1992 when Nadella joined Microsoft and he hasn’t regretted it. When he came to Microsoft bureaucracy was replacing innovation for the worse. What he achieved was to remove bureaucratic barriers to innovation. His work is of originality and individuality for as a husband and father he went through an emotional journey and learned what love and human ingenuity could accomplish. He recalls Gautama Buddha, who was born in Lumbini, Nepal and who attained his enlightenment in Bodhgaya in India. Buddha left his palace and set out to understand why people suffer. One has to become comfortable with the impermanence of this world and one’s existence. Deeply understanding the impernanence of life leads to the development of equanimity, empathy and compassion for everything around you, whether with disabilities, the inner cities and the Rust Belt to the developing countries of Asia, Africa and Latin America. In the Afterword Satya says: ‘What does it mean to ‘Hit Refresh? I encourage you to answer that for yourself. Start the conversation in your institution, your community. And please, share with me what you learn and I’ll continue to do the same.